The painter slaving away, surrounded by half-finished canvases and empty paint cans. The writer sitting hunched under lamplight after midnight, pen grinding away at a notebook. The guitar player, head bent, playing variations on a simply melody, endlessly stopping and restarting to find the right note. These are classic images of the artist at work. But what of the 21st century and the boom of video games as the most profitable form of art on the market? What is its iconic image of the artist at work? 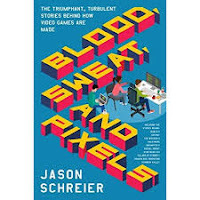 Jason Schreier’s 2017 Blood, Sweat, and Pixels: The Triumphant, Turbulent Stories behind How Video Games Are Made takes a look at what that might be. Case-based journalism, Blood, Sweat, and Pixels takes a look at the making of ten well-known video games over the past decade. Personally interviewing and engaging with the game’s directors, creators, artists, CEOs, animators, technical leads, play testers, programmers, story writers, producers, etc. the book provides a comprehensive view of the obstacles, luck, quality choices, challenges, and limitations each game faced on its way to glory, infamy, and in one game’s case, nowhere. Not a technical book (i.e. how to make a video game step-by-step), Schreier looks at the interlock of budget problems, time restraints, ambition, failed and kept promises, market concerns, publisher interference, lack of coherent teams, the value of strong vision, and a number of other topics, and how these combined to give us the games we are familiar with, for better or worse. The people interviewed are amazingly candid, and the stories they tell and information they pass on makes for an honest look—not exposé—of the real concerns of video game developers in the 21st century. Many (if not all) of the games covered in Blood, Sweat, and Pixels will be familiar to modern gamers. From small indie games to big AAA titles, massive open world rpgs to small 2D platformers, Schreier covers the majority of game types on the spectrum of video games today. The titles covered include Pillars of Eternity, Witcher 3, Shovel Knight, Stardew Valley, Destiny, Dragon Age: Inquisition, Star Wars 1313, Uncharted 4: A Thief’s End, Halo Wars, and Diablo 3, and within these chapters Schreier takes an in-depth look at their devlopment in a fashion of interest to anyone who loves those games. What is not included are sports or racing games (which would have been interesting from the point of view: how to make a game each year that is different from the previous year’s, yet whose basic rule set cannot change). Further obvious exclusions include: Japan, the place where the modern video game industry really took root and launched itself. It would have been interesting to get a Japanese game’s story, particularly how Japanese culture translates into differences with game making in the West. Another exclusion is a look into making a game from purely the graphic/artistic side. How much time goes into initial sketches, challenges faced, by artists, how pixel art is developed, the virtues and vices of working with digital design tools vs. analog, etc. Where much of the book seems focused on the front-office issues (where certainly the most drama is unfolding in the overall context of game development),such a chapter would nevertheless have made the book more holistic from a creative standpoint. And, as short as the chapter would have been, it would have been interesting to see how a mobile game was made. Many PC and console gamers may turn their noses at the idea, but in the context of the book, it would have made for interesting contrast and comparison. My biggest takeaway from Blood, Sweat, and Pixels is how dynamic and unpredictable the creation of a video game is, and how this leads to a major investment of time from artists, programmers, etc. in the months and weeks leading up to release date (and how often said release dates are delayed because the teams are still slaving away, trying to realize their vision). Nearly every case study involved unexpected changes, major revisions of ideas that were previously thought concrete, and heavy crunch time to get the final 1% right. In short, the image I'm left with of game development is two-fold: meeting rooms with developers and producers spending hours arguing, negotiating, and compromising on what is in- and excluded from a game, and outside the meeting room the desk after desk of animator, artist, and programmer working late-late hours to make those decisions reality and get the game published on time. In the end, Blood, Sweat, and Pixels highlights precisely what a labor of love video games can be. Regardless the impact financial and market considerations have on the final product, the struggle and effort to bring to the screen the amazing interactive experience video games is largely described. The passion developers have can negatively affect games (as portrayed in the case Destiny), but it can likewise lead to amazing stories of entrepreneurship, artistry, and teamwork (as with Shovel Knight). Schreier a veteran reporter for the website kotaku, the book is written in accessible yet informative style and can be read by both the gamer and non-gamer alike, no knowledge of gamer jargon required. If you are a gamer or person interested in what goes into the making of video games, this is a fascinating read.